This house located in se Navaluenga province of Avila in the Sierra de Gredos . The construction of the house follows the architecture of a chalet but decorated in a rustic style since most of the furniture is made of wood. Nightclub with bar counter, fridge and grinder tap. Room of 4 single beds. Hall by which one of the terraces is accessed . A living room available de TV, board games and access to the back porch overlooking the viña. Kitchen perfectly equipped with a modern style. A bedroom with double bed y wardrobe. One single bedroom con comoda. Marital bedroom with access to the terrace. 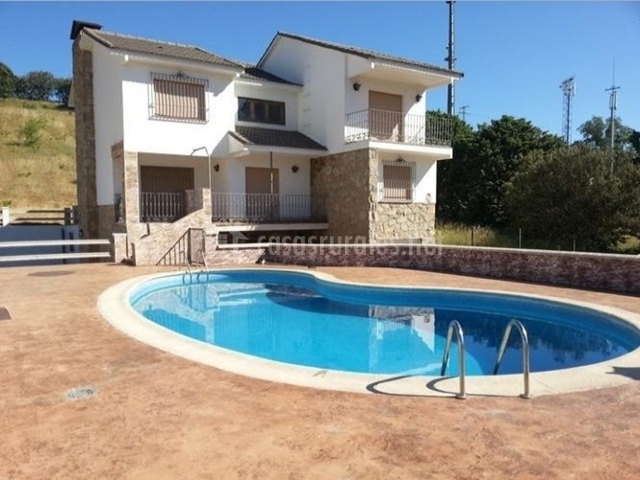 Outside the house is a huge pool fenced with tarmac around the floor, the house has de jacuzzi if you want to use, we pray that we previously communicate y also, carries an additional cost. also un patio with brick barbecue y a vineyard en the back of the house. From all the terraces there are wonderful views of the Sierra de Gredos. We also have a party room with a beer tap. Just 1 kilometer from the rural house are the "natural pools" of the Alberche River , passing through Navaluenga , ideal to cool off on hot summer days and its magnificent Roman bridge. You can also visit the hermitage of La Merced , dates from approximately s. XVII, located in Las Erillas, of singular importance of the day of Holy Thursday. At about 5 kilometers we can enjoy Marsh of the Burguillo , either to bathe, to fish or to enjoy water sports. At 38 km you can enjoy the magnificent capital of Ávila , with its great wall. El Potro "Tio Santos The Farrier", a monument where they wounded animals in the past. AlvaroyMati Diaz Fernandez Hello, my name is Álvaro, I've been in the rural tourism sector for 10 years. My job is to make a pleasant stay for all my clients. Water sports, horse riding, paintball, multi-adventure park, hiking, cycling routes, quad biking, triathlon, golf, paddle, fronton, heated pool, mycological days. Places to visit, the aguilar caves, the jerte valley, the swamp of the bruguillo, the virgin of the hawthorn, the walls of Ávila, the romanic bridge, the Sierra de Gredos. ¡5 % if you book a minimum of 7 nights!